This page will walk through Angular component styles :host, :host-context, /deep/ selector example. Component styles can use few special selectors such as :host, :host-context and /deep/ that works using shadow DOM scoping. Shadow DOM makes things separate from DOM of main document. Shadow DOM provides encapsulation for DOM and CSS. Shadow DOM can also be used itself outside of the web component. Shadow DOM makes CSS management easy and maintainable in the big applications. In Angular :host, :host-context, and /deep/ selectors are used in components that are in parent child relationship. The :host selector in Angular component plays the role to apply styles on host element. By default component style works within its component template. But by using :host selector we can apply styles to host element that resides in parent component. :host-context selector works same as :host selector but based on a given condition. /deep/ selector forces styles in its own components and in all child components. On this page we will discuss complete example of :host, :host-context, /deep/ selector step by step. Every component can have its own HTML file as well as CSS file. Component can also use inline HTML and CSS code. Find the use of some @Component metadata. template: Write inline HTML code. Find the advantage of component style over traditional CSS. 1. Class names and selectors are local to component and don't affect other part of application. 2. Changing style to other part of application does not affect the component style. 3. We can create CSS file component specific and can co-locate with them. 4. Removing and updating component CSS is easy because we need not to worry about whether else the CSS is being used in the application. Component styles have few special selectors that has been taken from shadow DOM style scoping. We will discuss here :host, :host-context, /deep/ selector with examples. Let us understand the working of :host, :host-context, /deep/ selector using diagram. In the above diagram we have few components in parent-child relationship. Find the explanation of pseudo selectors. :host : Style is written in child component but it applies on host element in parent component. Look at the diagram. 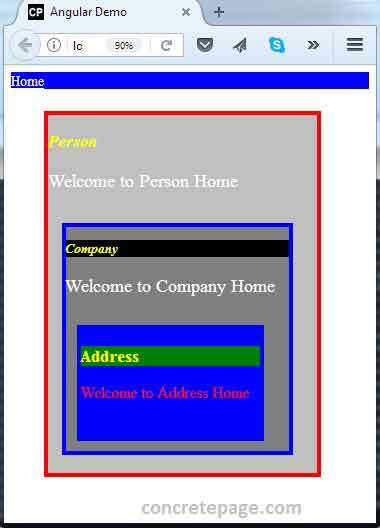 The style written in :host selector in PersonComponent will be applied in <router-outlet> element of AppComponent. The style written in :host selector in CompanyComponent will be applied in <app-company> host element in PersonComponent and so on. :host-context : It applies style on host element based on some condition outside of a component view. Condition can be like if the given CSS class is available anywhere in parent tree, only when the style written in :host-context will be applied to host element in parent component. /deep/: The style written in /deep/ selector will be applied on its own component template and down through the child component tree into all the child component views. In the diagram PersonComponent is using /deep/ selector. 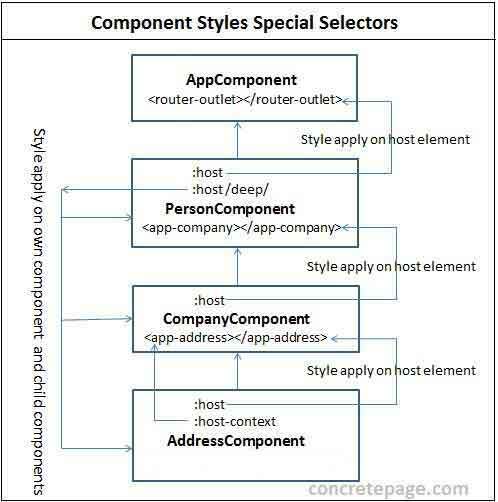 The style written in /deep/ selector will be applied in PersonComponent, CompanyComponent and AddressComponent templates. :host is a pseudo-class selector that applies styles in the element that hosts the component. It means if a component has a child component using component binding then child component will use :host selector that will target host element in parent component. :host selector can be used in component with styles metadata as well as with styleUrls metadata of @Component decorator. 2. Find the example of :host selector with styleUrls. If we use CSS file as follows. Then it is configured as follows. Now suppose we have a parent component as given below. The style written in :host() selector will be applied to <app-company> element. :host-context selector is used in the same way as :host selector but :host-context is used when we want to apply a style on host element on some condition outside of the component view. For the example a style could be applied on host element only if a given CSS class is found anywhere in parent tree up to the document root. In our example we have following components in parent-child relationship. Suppose we have a CSS class in AppComponent as follows. Now in the last component of the child tree i.e. AddressComponent, we will use :host-context selector as follows. The style given above will be applied on host element only when a CSS class named as my-theme will be found anywhere in parent tree up to the document root. /deep/ selector has alias as >>> . Component style normally applies only to the component's own template. Using /deep/ selector we can force a style down through the child component tree into all child component views. /deep/ selector forces its style to its own component, child component, nested component, view children and content children. Suppose we have components with parent child relationship as follows. In PersonComponent we are using following CSS file with /deep/ selector. The above style will be forced on templates of PersonComponent, CompanyComponent and AddressComponent. Component CSS are encapsulated into the component's view and don't affect the rest of the application. We can change this behavior using ViewEncapsulation enum. There are three types of encapsulation. Native view encapsulation uses browser's native encapsulation mechanism. Emulated is the default view encapsulation in our angular application. None means no view encapsulation. In our component we can configure view encapsulation as follows. Suppose we want to enable Native encapsulation.